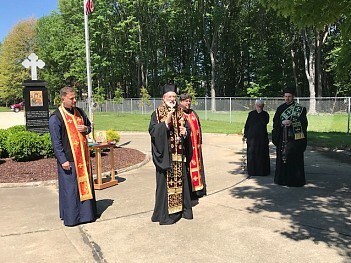 On Pentecost Monday, His Grace Bishop Irinej of Eastern America celebrated the Divine Liturgy a the St. Sava Serbian Orthodox Church in Broadview Heights, Ohio. Concelebrating with him were Protopresbyter Mijoljub Matic, Parish Priest and Economos Dragan Goronjic, Dean of the Cleveland Deanery of the Eastern American Diocese, together with Protodeacons Milos Zdralic, Diocesan Financial Secretary, and Ljubisa Mitrovic, Parish Deacon. Responses were sung by singers from the Njegosh Cathedral Choir, under the direction of Milan Damljanovic. In his sermon, His Grace, interpreting the Gospel lection on the "little ones" and the purity of their lives. He continued by speaking of the outpouring of the Holy Spirit as the Chrismation of the world, and the renewal of our own Chrismation, wherein our five basic senses become anointed virtues, which enable us to live our lives in the Holy Spirit. 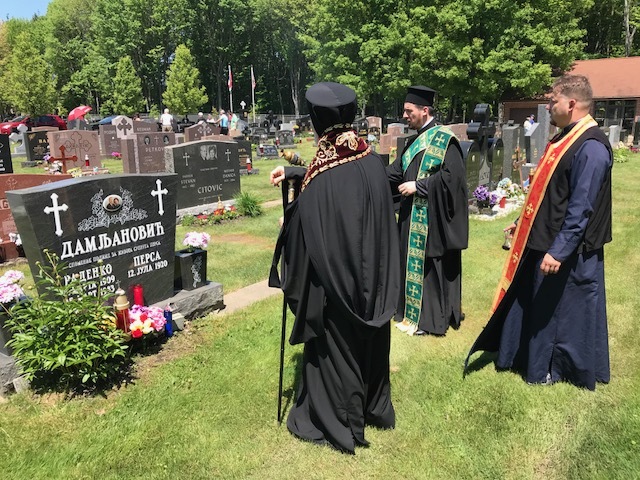 Following the Divine Liturgy, Bishop Irinej together with the remaining celebrants led the faithful gathered at the St. Sava Cemetery on the grounds of the St. Sava Church in a general Memorial Service, wherein over 800 names of the departed were read in their remembrance. Addressing those present, His Grace explained the American tradition of civil Memorial Day. He then spoke of remembrance as the ability to elevate the names of those departed as the object of our love and place them in the Lord, who is the Life and Resurrection. In the embrace of Christ, who is the God of the living, all are alive, confirmed by our singing of Memory Eternal. Following which, His Grace and the clergy blessed individual graves with prayer and the pouring of wine. The same individual prayers of remembrance for the departed were offered later for the departed at St. Theodosius Orthodox Cemetery.